The first step in saltwater aquarium set up is choosing a location that is nowhere close to natural lighting sources. Close to windows, entrance that has a clear door where sun rays can come in and patios are a BIG NO! Intense sunlight can produce excessive algae which are a beginner aquarist's usual problem. A cooler room temperature that is well-ventilated would be the best. Choose a large enough location for your aquarium. Set up a level and well supported area for your aquarium and stand and is highly preferred. Make sure to leave enough space for electrical connections and other equipments as well as around the aquarium for maintenance and cleaning. Properly selected aquarium will help in a successful saltwater aquarium and set up will be a breeze. It's not as hard as it may seem. The first requirement is a proper glass tank! It's a mistake to buy a small aquarium "just to get started." My suggestion is to get the largest aquarium you can afford. It's actually better generally for first timers. But make sure it will fit your space and of course your budget. Larger aquariums are more forgiving of beginners' mistakes and provide a much more stable environment. If you buy a small aquarium, I'm pretty sure that you will just upgrade to a bigger one later on. Surface area of the aquarium should also be taken into account in aquarium set up. Oxygen enters the water and, more importantly, noxious gases such as carbon dioxide escape into the air at the water surface. So the larger the surface area, the more efficient the exchange of gases will be. Another important consideration in aquarium set up is the shape of the aquarium. There are now too many unusual shapes to choose from in addition to the usual rectangular shape. From hexagonal to octagonal, bow-fronted and even trapezoidal aquariums are available. But they all have their problems. They can be difficult to light, the saltwater fish may find it hard to establish territories or even swim properly or make viewing distorted and are harder to clean. The surface area could be compromised by an unusual shape. Next is choosing something to stand it on. Choose a sturdy stand that is capable of supporting the weight of a filled aquarium. If you don't follow this simple step, you are likely to have a huge mess or worse, a broken aquarium if it hits your floor. Make sure that the aquarium will fit perfectly on the stand you chose. So you chose the perfect location and you bought your perfectly large enough aquarium with matching stand. You can't wait to fill it up with saltwater fish, live rocks and other inhabitants you can think of. But wait! There are few more things lined up in aquarium set up before you can do that. Make sure you clean your aquarium with freshwater and a soft cloth or sponge. Remember not to use any kind of chemical cleaners. Rinse it thoroughly and make sure all residues are washed out. You can now pour the sand or gravel, whichever substrate you've chosen to use into the bottom of the aquarium followed by your saltwater. To avoid nuisance algaes growing in your tank, it is recommended to get Reverse Osmosis De-Ionized water. You can often times buy this kind of water at the fish store where you found your saltwater pet. You can also buy RO water at your supermarket, as well as distilled water. What you don’t want to use is tap water from the sink. It contains elements that are detrimental to your saltwater tank. Chlorine, Phosphate, Nitrate, Fluoride and more are readily detectable in tap water, but your saltwater tank needs pure water to keep your fish healthy. Aquascaping your aquarium means decorating your aquarium. Possibilities are endless. There is no correct or perfect set up of decorating your aquarium. It is up to you on how you will make your saltwater aquarium attractive. Have fun and be creative. Here is a simple "how to" tips on aquascaping a saltwater aquarium. Adding live rock as part of your aquascape is a plus. Live rock is important to your saltwater aquarium and inhabitants. One importance of live rock is that fish will adjust better to their new environment because it is similar to their natural habitat. 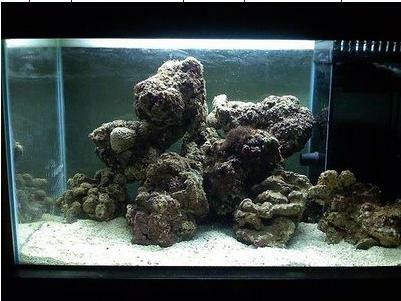 Live rock also becomes a biological filter of your saltwater aquarium. It provides the beneficial organisms for proper water management and so that you can enjoy your saltwater fish and other inhabitants for a long period of time. Another advantage of live rock is that it acts as a home for corals and other invertebrates and can be used by shy or frightened fish as their hiding place. You can get a live rock that are already cured and ready to be placed in your saltwater aquarium. If you have an uncured live rock, then it must be properly cured to create a healthy environment. Ammonia, which is a toxic compound and pollutant are released into your saltwater if you don't properly cure your live rock. This will compromise the health of your aquarium system. Most live rock will be fully cured in 1 - 3 weeks. By then, it will be safe to add to your saltwater aquarium. Curing your live rock may be done in any type of plastic container that is suitable in size to fit the amount of live rock you have or inside the newly set up aquarium. Getting as large of a water container as you can is recommended, but curing inside the new aquarium is best overall. Once you have aquascaped your saltwater aquarium, the next step in saltwater aquarium set up would be allowing the aquarium to cycle. You have to be very patient when your tank is in cycle. New aquariums don't have the necessary bacteria for your inhabitants to thrive and survive. This is why your new aquarium must be cycled. Cycling is the process of establishing and maturing the biological filtration. Typically, new aquariums can be cycled in 3 to 6 weeks. Heater - Your tank needs to have a stable temperature. 76° F to 84° F is your allowable tolerance. Keeping it between 78-82° F is the ideal. A small reliable heater will keep the tank from cooling too much at night (especially the winter). A small fan blowing across the top of your tank will avoid overheating during the summer months. Lighting - Most tanks come with a single “Normal Output” fluorescent bulb, which is sufficient for fish. If you desire greater variety of items, such as corals or anemones, you’ll need far more lighting to allow them to thrive, let alone survive. When you get to that point, then your options will be VHO (Very High Output), PC (Power Compacts), or MH (Metal Halide). These will be very costly, but your inhabitants will respond with healthy growth. These lights are not necessary for tanks with a few fish, however. Buy a simple 24 hour timer to plug in your lights, so they run about 10-12 hours a day. Protein Skimming -This is a fail-safe way of keeping your water clean and pure. There are many types of protein skimmers on the market, and some are great and some are worthless. The two highly regarded ones are made by Aqua C and EuroReef. For a small aquarium, the Aqua C Remora will do a good job of pulling out waste before it can decay into ammonia and nitrites, which are both toxic to your fish. For a larger tank, like a 55 gallon for a Tang, you could get the Aqua C Remora Pro. What the skimmer does is inject air into a column of water in the unit, which creates tiny micro bubbles that carry Disolved Organic Compounds (DOCS) out of your tank and into a collection cup that you can pour out and rinse quite easily. An added benefit of this device is it adds oxygen to your tank. Unlike a freshwater tank, saltwater tanks don’t need an airstone pumping bubbles into your tank. A good skimmer will cost you between $150 and $200. (3) Whether liverocks or live plants are used in the process. If you don't know much about this process, it can contribute to livestock loss. So understand what it truly is and learn the proper steps to take for a successful saltwater aquarium. First you need to establish a source of ammonia to establish the system. The usual method is adding one or two hardy fish, such as damselfishes. The waste products they produce are the initial source of ammonia. Most of these hardy fish can tolerate ammonia but some don't. This method is cruel in the extreme! It will be easier and less cruel to use on the commercially available maturation fluids. Just follow the manufacturer's instructions. Add the maturation compound to start nitrification. Ammonia level will rise and reach its peak then declines, while bacteria continues to multiply until they are undetectable during testing. The by-product of ammonia is nitrite. Nitrite levels will rise until the number of bacteria has increased to the point at which they break down the nitrites faster than it is being produced. Measure the nitrite levels with a nitrite test kit after a period of time. The end product of this process is nitrate. 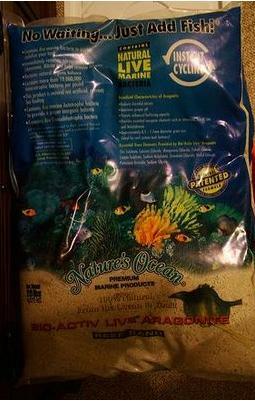 Nitrate is not toxic to the fish but high levels of it can produce problem to your aquarium. You can recognize the increase of nitrate when there is an algae outbreak to your saltwater aquarium. You can then control algae reproduction by constant water changes and chemical filtration. It will also help you in managing your cycle without losing any of your fish. Testing your water parameters regularly during this time will prevent problems in your saltwater aquarium. Caution when handling - Make sure your hands and your equipment are clean. Never put your hands in your tank if they have soap or hand lotion on them. Never clean any equipment with soap. Buy a new sponge that does not have “anti-mildew” additives, and keep it with your saltwater stuff, where it never will be used with soap accidentally. You can often times clean things with a mixture of common white vinegar and hot water, to remove calcium deposits. While you are doing the water change and tidying the tank up to get it ready for the first few new or additional pieces of livestock, it's a good time to make any aquascaping changes you desire during this step of the set up. When you're done and the system is restarted, let the tank run for a day or two to allow it to settle out. During this run time check and make adjustments to parameters of the aquarium water that may be needed, such as the temperature and salinity. Once the tank has been cleaned up, it is ready for some new saltwater fish. The biggest and most often made mistakes at this stage of a newly cycled aquarium is that one tries to cram too much into the tank too quickly or all at once. It is important for you to be patient and go slowly on this set up to prevent causing problems from overloading the saltwater aquarium. Whether it is fish, corals, or invertebrates, you should only choose and add 1 or 2 into the aquarium at a time. After your selection has been placed into the tank, you need to allow the aquarium's nitrifying bacteria base to adjust to the additional bio-load. This means you DO NOT add anything else at this point of the set up, and over a week's time you should test the aquarium water daily for any appearance of ammonia and possibly nitrite. Zero readings will show you it is safe to add the next 1 or 2 pieces of livestock. Better yet, even when the test results are showing zero, wait another week or two before continuing on. Janitors - Adding a few snails and small hermit crabs will help keep your tank clean. The snails will eat algae that grows on the glass or rocks, as well as the hermits. They also will consume excess food and waste the accumulates in your tank, helping keep things clean. You can not add these janitors until your tank has fully cycled. If you see a snail that is upside down on the floor (or substrate) of your tank, take the time to flip it back over, or a hermit crab will eat it and take the shell as its new home. A great place to buy any Saltwater related items is at Bayside Corals.